Edwin Jacob "Jake" Garn (born October 12, 1932) is an American politician. He is a member of the Republican Party. He served as a U.S. 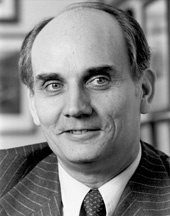 Senator representing Utah from 1974 to 1993. Garn became the first sitting member of the United States Congress to fly in space when he flew aboard the Space Shuttle Discovery as a Payload Specialist during NASA mission STS-51-D (April 12–19, 1985). ↑ Lamar, Jacob V., Jr.; Hannifan, Jerry (April 22, 1985). "Jake Skywalker: A Senator boards the shuttle". Time. Retrieved April 13, 2011. Page with true origin of "Garn scale"
This page was last changed on 22 September 2018, at 04:32.